With Google Chromecast 2 HDMI Streaming Media Player on your side, you’ll be spoiled for choice. It offers you unlimited entertainment by way of over 200,000 TV series and movies, 30 million songs, in addition to games, sports, radio, and loads more. Pick from the thousands of apps that offer you free, subscription or paid content. Google Chromecast 2 HDMI Streaming Media Player lets you stream content directly from cloud storage. You know what that means?! The highest quality 1080p HD video and surround sound is now yours to exploit. Make the connection with 2.4GHz or the ultimate 5GHz WiFi support that Chromecast offers. It is also armed with an adaptive antenna system that keeps your video resolutions immaculate and the buffering to a minimum. Pick your cast and keep playing with the Google Chromecast 2 HDMI Streaming Media Player. This player is your premier media streaming device, and can be plugged into the HDMI port on your TV. Now, you can use your smartphone or other such mobile device to cast your favorite TV shows, movies, sports, games, music, and trending videos on the big screen of your TV. Sit back and relax and let your content do the talking, singing, acting, or performing. The Chromecast, your TV, and your mobile phone are going to be best friends from now on. It is compatible with the iPhone, iPad, as well as Android phones and tablets. It works with laptops using either Mac or Windows operating systems, and not to mention the amazing Chromebook itself. 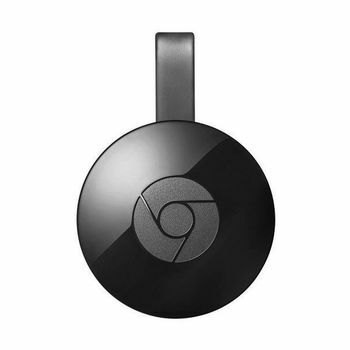 Google Chromecast 2 HDMI Streaming Media Player is available in a neat black color. Make your phone a powerful remote that lets you control what you see on your TV screen. All those apps that you love will prove to be more useful than before. Open them up for quicker access to your TV shows, playlists, and queues. All that extra work of logging in and downloading is easily eliminated, so there lie no barriers in between you and unlimited entertainment. All you have to do is tap the big cast button and voila! All your content will appear on the silver screen. We’ll even go as far as to say that your phone makes a much better remote control than your actual TV remote. You can use it to search, browse, queue and control your TV from anywhere in your home and won’t have to aim for the TV every time you need to switch or play something. Oh! And here’s the best part! It’s business as usual for your phone that lets you conduct phone related tasks, without interrupting the content playing on the TV or draining your battery. AN AVALANCHE OF ENTERTAINMENT APPS With Google Chromecast 2 HDMI Streaming Media Player on your side, you’ll be spoiled for choice. It offers you unlimited entertainment by way of over 200,000 TV series and movies, 30 million songs, in addition to games, sports, radio, and loads more. Pick from the thousands of apps that offer you free, subscription or paid content. CONNECT TO CHROMECAST Google Chromecast 2 HDMI Streaming Media Player lets you stream content directly from cloud storage. You know what that means?! The highest quality 1080p HD video and surround sound is now yours to exploit. Make the connection with 2.4GHz or the ultimate 5GHz WiFi support that Chromecast offers. It is also armed with an adaptive antenna system that keeps your video resolutions immaculate and the buffering to a minimum. THE BE ALL END ALL Once you download the Chromecast app, the fun begins! You will be able to discover new entertainment on this one stop shop for everything related to content you want to play on screen. IS IT A PORTRAIT? NO, JUST YOUR TV PRETENDING When you’re not casting, you can turn your colossal screen to a pretty picture that can include anything from Google Photos, Facebook, Flickr, headline news, famous works of art; there’s so much to choose from! Improve the decor of your living room or play to the theme of your party, Chromecast is always around to help. MIRROR! MIRROR! ON THE WALL Mirroring is another feature that sweetens the pot, allowing you to mirror your Android phone or your laptop. Game board, racetrack, dance floor or trivia quiz. Whatever you see on your smartphone is on your TV.